Bringing together a wealth of American filmmakers including Ti West and Joe Swanberg, V/H/S (2012) is an experimental horror anthology that looks to have the last word on the topic of ‘found footage’. The cinematic collage follows a group of detestable young men make their living by accosting women and gratuitously making them reveal themselves to the camera. Contemplating the future direction of their repugnant business venture, one of the group mentions a job offer that he’s received that would be far more lucrative. 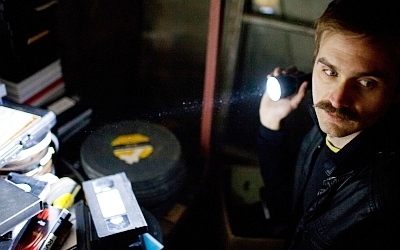 The job seems simple at first – break into a dilapidated house and retrieve a video tape. However, once they’ve forced their way into this run-down home, they discover a myriad of different tapes, each with its own horrific tale to tell. This impressive idea for a horror is commendable for how it successfully manages to encompass the breadth of horror sub-genres. Each video tape contains a different style of horror filmmaking – from an inventive slant on the slasher movie, where a group of libidinous teens find their trip to an isolated lake fraught with danger, to a delightfully unnerving psychological thriller that plays with fear of what happens when we sleep, V/H/S has something for every form of horror aficionado. However, V/H/S’s varied collection of genre tropes and approaches is also its undoing, culminating in a divisive project that perhaps only the most ardent of fanboys will be able to appreciate as a whole. Those who prefer an individualistic, consistent style or a have a distinct loathing of particularly generic techniques will likely to find their appreciation of this ambitious project shifting wildly throughout. V/H/S does have one underlying theme however, which runs through all of its narrative departures – namely, a cultural attack on misogyny (which is rife within the genre). Each short film (and the movies’ framed narrative), contains a cast of deeply deplorable men, each with their own abhorrent view of women. These loathsome characters at some point each come across an empowered female antagonist who punishes their sexist ignorance in numerous shocking ways. However, on numerous occasions the degree of misogyny on screen – much like some of the handheld camerawork – is almost un-watchable. Collaborative experiments like V/H/S generally tend to struggle from a varying degree of success, and that’s very much the case here. However, this admirable endeavour has just enough frights, scares and ingenuity to make it necessary viewing for die-hard horror lovers. The 66th Edinburgh International Film Festival takes place from 20 June-1 July, 2012. For more of our EIFF 2012 coverage, simply follow this link.